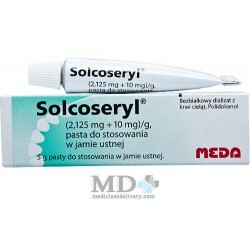 Solcoseryl is used to treat: Occlusive peripheral vascular diseases in Fontaine stage 2 or 3; Chronic venous insufficiency manifested in trophic disorders. Solkoseril contains factors that enhance the metabolism in tissues and accelerate the process of regeneration (recovery). Solkoseril appoint at obliteriruyushih vascular diseases of extremities (diseases associated with impaired patency of vessels of the lower extremities) with chronic venous insufficiency of the lower limbs of diabetic angiopathy (violation of the tone of blood vessels due to high blood sugar), trophic ulcers (slow-healing skin defects); 2-3 degree burns, skin plasty, bedsores (necrosis of tissue caused by prolonged pressure on them by lying down), maceration (softening and destruction of tissues due to prolonged exposure to liquids) lesions of the cornea (the clear covering his eyes) of various etiologies (causes): keratitis (inflammation of the cornea), erosions (mucosal surface defects) and corneal ulcers, chemical burns of the cornea, for pre-and postoperative treatment with keratoplasty (surgery to replace a damaged cornea). Assign intramuscularly or intravenously, and topically as an ointment or jelly. Usually spend a combined treatment: medication used in the form of injections and topical. After improving the status and the start of epithelialization (re-skin surface or mucous membrane) is used only externally. When bedsores prescribe intramuscular or intravenous injection of 1-2 capsules per day and topical (gel) before granulation (formation of connective tissue in place of the wound surface), then the ointment until the final epithelialization (re-skin surface or mucous membrane). With burns - 2-4 capsules per day intramuscularly or intravenously and local ointment or jelly. When radiation skin lesions used topically an ointment or jelly, 1 ampoule per day intramuscularly or intravenously, for the prevention of radiation skin lesions, skin smeared with ointment solcoseryl; lubrication continued for 2 weeks. after irradiation. In severe trophic lesions (ulcers, gangrene) is introduced to 4-5 ampoules per day simultaneously with local therapy. Intravenous appoint a conventional injection (1-2 ampoules) or drip (3-5 ampoules in 250 ml 5% glucose solution or isotonic sodium chloride solution). The drug can be administered intraarterially drip (3-5 ampoules in 500 ml 5% glucose solution or isotonic sodium chloride solution). Duration of treatment depends on the nature of the process and its flow. Usually it lasts 4-8 weeks. With the trend towards a repetition of the process is recommended after complete epithelialization continue to use the drug for 2-3 weeks. 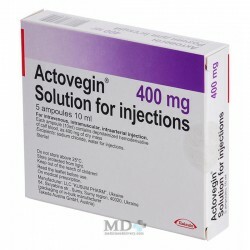 (1-2 ampoules per week intramuscularly or intravenously). Simultaneously with solcoseryl possible if necessary to use antibiotics, vasodilators and other means. There are performance solcoseryl (pain relief, acceleration of ulcer healing) in the treatment of gastric ulcers and duodenal ulcers, severe pneumonia. Used intramuscular injection of 1 ampoule (2 ml) 1-2 times a day for 10-12 days. When the complex treatment of chronic colitis (inflammation of the colon) is requested to apply with microclysters solkoserilom. The contents of one tube (20 grams of iron) diluted in 30 ml of warm boiled water after cleansing enema is administered daily for 10 days. In a special dosage form (20% gel) used in the treatment of diseases of the cornea (the clear covering his eyes) (trophic / associated with malnutrition tissue / lesion, infectious dystrophy / reduction function due to infection / cornea, etc.). 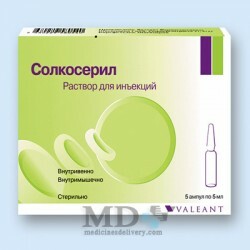 The drug is injected into the conjunctival sac (the space between the rear povrehnostyu eyelids and the front surface of the eyeball). The drug is generally well tolerated. When used in jelly form can burn the skin, which does not require discontinuation of treatment. Not identified. When using the eye gel is not recommended to drive vehicles. Ointment and jelly in the box on 1920 Eye Gel in tubes. The solution for injection of 2, 5 and 10 ml vials in a package of 25 pieces. Extract from the blood of cattle, the drug released from the protein.